It’s Sweating to the Oldies, back before they were oldies. ARE you bulky of body, and heavy of heart? Would you really like to reduce? Will you accept without cost the proof that you can? Then read what this man has done! Not long: ago, in Chicago, it was stated that the scientific secret of weight regulation had been discovered. Wallace, a leading physical director, had worked seventeen years to make the announcement. But it did not take long to prove it was true. UNDER observation of the press, he took fifty persons, each at least 50 lbs. overweight. Pictures and weights were published daily. In exactly forty days, every member of the class was down to normal weight and measurements! Nothing so crude as starving was employed; the method lets one eat. In fact, Wallace’s success in reducing is due to his discovering that food does not cause fat. When you stop and think, some of the most humorously fat folks eat less than a child. Wallace simply found a way to prevent the system from turning too much of what is eaten, into fat. His course gives you things to doâ€”to musicâ€”which makes your system use every bit of nourishment for blood, bone and sinew. Nothing is left from which to make fat. Getting thin to music is simple enough, but results are fairly astounding. THIS interesting course has reduced thousands of women living in all parts of the U. S. Most of them had tried other means of losing weight without success. A typical example is Mrs. Grace Horchler, who resides at 4625 Indiana Ave., Chicago. She weighed 242 lbs. and in four months reduced to 168 lbs. This loss of seventy-four pounds was accomplished solely by Wallace’s reduction records, sent her by mail. Because of the natural method of reducing,|herbody was left symmetric, firmly moulded. A hundred similar instances are on record, while the loss of fifteen, twenty or thirty pounds seems mere play; innumberable women have reported reductions of these amounts. Every mail brings new letters of appreciation. 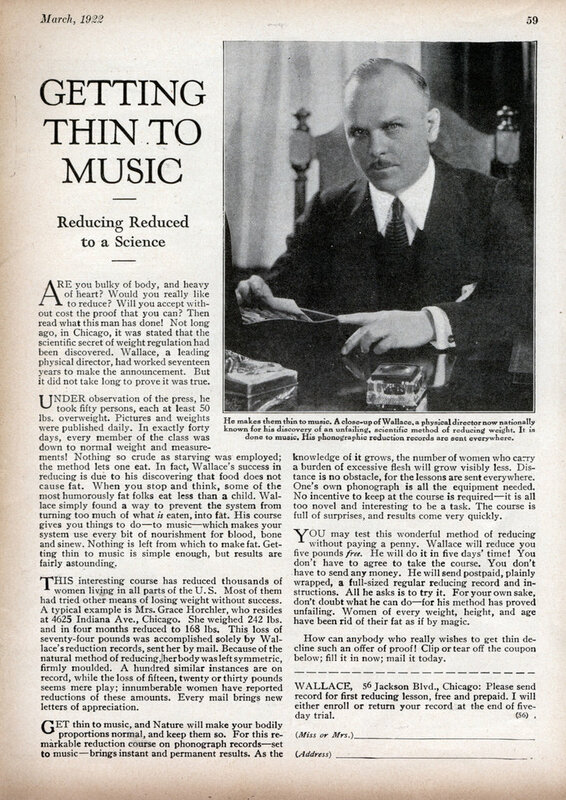 GET thin to music, and Nature will make your bodily proportions normal, and keep them so. For this remarkable reduction course on phonograph recordsâ€”set to musicâ€”brings instant and permanent results. As the knowledge of it grows, the number of women who carry a burden of excessive flesh will grow visibly less. Distance is no obstacle, for the lessons are sent everywhere. One’s own phonograph is all the equipment needed. No incentive to keep at the course is requiredâ€”it is all too novel and interesting to be a task. The course is full of surprises, and results come very quickly. YOU may test this wonderful method of reducing without paying a penny. Wallace will reduce you five pounds free. He will do it in five days’ time! You don’t have to agree to take the course. You don’t have to send any money. He will send postpaid, plainly wrapped, a full-sized regular reducing record and instructions. All he asks is to try it. For your own sake, don’t doubt what he can doâ€”for his method has proved unfailing. Women of every weight, height, and age have been rid of their fat as if by magic. How can anybody who really wishes to get thin decline such an offer of proof! Clip or tear off the coupon below; fill it in now; mail it today. WALLACE, 56 Jackson Blvd., Chicago: Please send record for first reducing lesson, free and prepaid. I will either enroll or return your record at the end of five-day trial. I’d like to try this out, personally. I could use some reduction! My father used to play an exercise record by a man named Wallace and I would greatly enjoy getting a reproduction. It would start by saying “let’s get aboard the streamliner” with a train whistle in the background. However, I think it was circa 1940-1950. I have the records by Wallace, 6 78’s with three exercises on a record. They also started with “let’s get aboard the streamliner”. I received the records in 1950 and have been exercising to them ever since. I have recorded them on cassettes, but would like to have them transferred to a CD. Is this somehow possible somewhere? This to me is just as good an exercise program as any they have out today. It’s easy if you have a cassette player w/earphone jack. You need a cable with a plug on each end. Plug one end into the earphone jack. Plug the other into the computer’s mic jack. Using software such as Creative or Nero play and record the cassette then save it as an MP3 audio file. Save the files to a DVD.